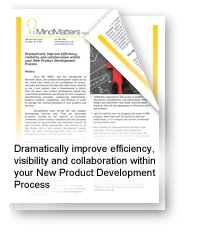 We help accelerate your new product development processes, improve speed-to-market and increase your return-on-investment! We help you improve the identification, tracking, processing, security, and protection of your most valuable asset – Intellectual Property. 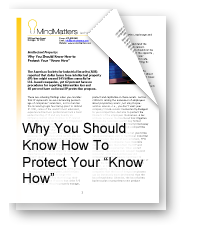 The goal of MindMatters’ Intellectual Property Assessment Program is to dramatically improve the identification, tracking, processing, security and protection of an organization’s intellectual property. We examine your organization’s “intellectual property” capabilities, policies, and processes, and determine where and how to best improve initial identification, processing efficiencies, tracking, security and protection for your trade secrets, trademarks, copyrights, and patent-able innovations. We examine your “IP success” to determine ways to enhance and build upon your previous achievements. At the end of our IP Assessment, we provide management with the results of our assessment, as well as, a comprehensive set of recommendations for achieving your organization’s desired IP success, security and protection. We uncover the obstacles, remove the road blocks, and provide the fuel to ensure new profitable innovations and solutions cross the finish line! 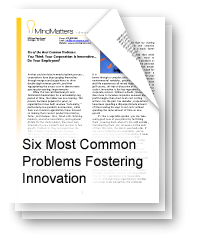 The goal of MindMatters’ Innovation Assessment Program is to dramatically improve the results of an organization’s innovation practices. During the Innovation Assessment, the MindMatters’ Team examines the characteristics of your industry, your business, your goals and objectives, your employee demographics and culture, as well as, current and previous innovation programs to arrive at a plan for generating targeted innovation and achieving your desired business results. 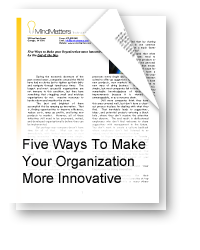 We examine your organization’s “innovation” capabilities and processes, and determine where and how to best improve productivity and achieve results. We uncover possible areas of failure so that they can be corrected. We examine your “innovation success” to determine ways to enhance and build upon your previous achievements. At the end of our Innovation Assessment, we provide management with the results of our assessment, as well as, a comprehensive set of recommendations for achieving your organization’s desired innovation success.